Wondering what boy I will see today. Other times you don’t see me at all. Wishing I could bring you back around. Every day the world will always love you. Rachel Alexander is originally from the UK, but moved to the US in 2009. She is married with two children Max and Isla, and lives in Houston, Texas. In 2014, Max was diagnosed with Autism at the age of 2. Over the last 4 years, Rachel and her family has learned to live with and embrace everything that Autism brings. It is this journey that has inspired her to start writing poetry. She created a Facebook page called ‘Autism Through Poetry’ with the hopes that her poems will help others know that they are not alone. She hopes to encourage acceptance and create a better understanding of life with autism; ultimately providing comfort to those who need it most. Rachel Alexander is originally from the UK, but moved to the US in 2009. She is married with two children Max and Isla, and lives in Houston, Texas. In 2014, Max was diagnosed with Autism at the age of 2. Over the last 4 years, Rachel and her family has learned to live with and embrace everything that Autism brings. It is this journey that has inspired her to start writing poetry. She created a Facebook page called ‘Autism Through Poetry' with the hopes that her poems will help others know that they are not alone. 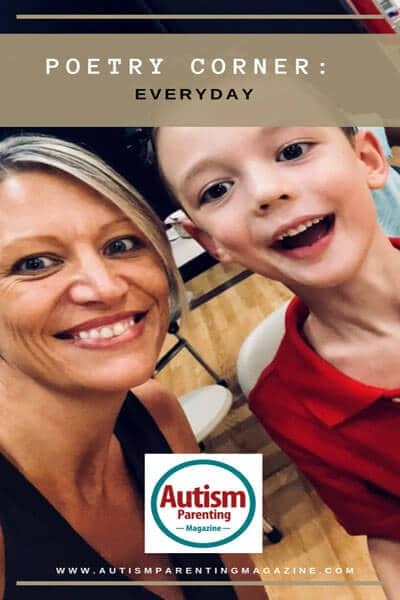 She hopes to encourage acceptance and create a better understanding of life with autism; ultimately providing comfort to those who need it most..